I've been working on 3 areas of savings in 2013 and I gave you an update at 10 weeks. I thought now that we're at 20 weeks I'd update again. First is the 52 weeks of savings plan with DD#1. The original idea is to save $1 the first week of the year, $2 the second week, et c, all the way to $52 the last week of the year. We modified it so that we can save any of the weekly assigned amounts as long as we do all 52 over the course of the year. We quickly filled up the lowest numbers ($1 through $10) so I am trying to reserve many of the "teens" for weeks when I am low on funds. I have been trying to set aside whatever is left from my weekly household allowance for this project, but it's harder and harder to add the big numbers! We did use the $52 recently. 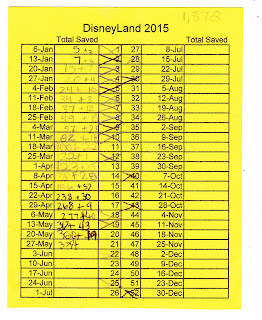 So far we have saved $379 for Disneyland! Here is DD#1's chart. We write on it each Monday crossing off which weekly amount we're saving and adding it to our running total. Then DD#1 counts it all up to make sure we added correctly. The next savings project is setting aside $10 each week for big summer bulk food purchases like peaches and apples that I will can. 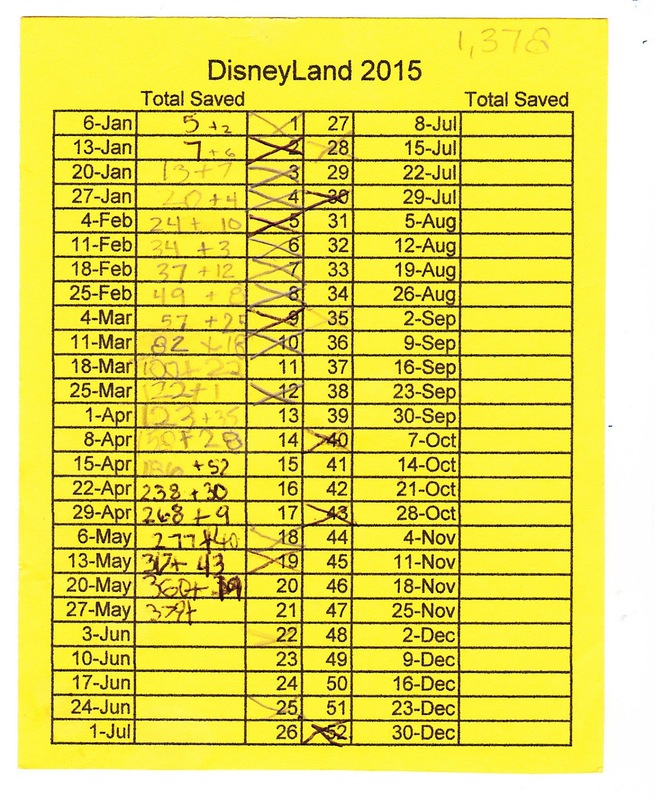 Unfortunately this savings project is not going as well as the Disneyland savings. I've only set aside $70 all year. But $70 is something and it will mean that my entire weekly household allowance won't go toward the 150 pounds of peaches I hope to buy. I have not abandoned this project but it's increasingly difficult to set aside $10 when I also am trying to save over $20 for the Disneyland savings and also withhold small bills to buy eggs. I'm hoping to put a big "catch-up" chunk of cash in this envelope after our garage sale in June. Finally, we are also saving for Christmas expenses. We have been able to budget $100 each month so far in the first 4 months of 2013. I am hoping it works out for May, too. I'm also already stockpiling some stocking stuffers and using my weekly household allowance for that instead of the Christmas savings. I'm hoping over $1,000 as we approach Christmas will help significantly with gas, Christmas card postage, tickets to special events, and last minute gifts!